The infamous resthyro gets a new name and a new package. Nothing inside has changed though and there has been no news of any significant difference in the product itself. The package comes with a eye dropper perfectly for ease of administering the product to your cat. If you dont know what Thyroid Support Gold or Resthyro is, check out the former posts here. 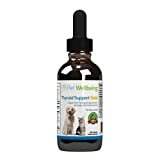 Thyroid Support Gold is a product dedicated towards improving your cat’s thyroid conditions and control hyperthyroidism. Hyperthyroidism affects cats during middle age or old age. Cures include radio therapy to high end drugs. the Thyroid Support Gold or Resthyro is the only Drug in the market which is natural. For more information check out petwellbeing.com or click the link below.